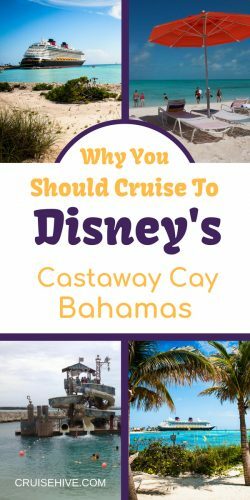 If you’re thinking about taking that much-needed cruise vacation with Disney Cruise Line then you’ll likely be spending one of the days at Castaway Cay, Bahamas. If you haven’t been to this place you should put it on your bucket list. Located in the Bahamas near the Abaco islands, Castaway Cay is a 1,000 acres of pure Bahamian Magic. From the white-sandy beaches, swaying palm trees, lush vegetation, sea and animal life, this small island has it all. The fact that the island is Disney’s you can expect extra features from the Imagineers at Disney. They have done an incredible job, designing the island’s cruise guest area to mimic some of their adventurous themes. Perfect for families with Kids and even that solo cruiser. If you get a chance to visit this beautiful place, here are things you should know about the cruise port. Castaway Cay was not always called so. It was originally known as Gorda Cay and only changed its name when Disney secured a 99-year lease of the cay in 1977. This little island has an interesting history featuring bootleggers, pirates and drug smuggling. Disney, however, sanitized this story by creating a make belief story about the island. The story is displayed on boards and clues all over the island. The story is about three adventurers who set sail with their families and crews looking for fortune. And instead got castaway in the island after their shipwrecked. Giving rise to the name Castaway. Using $25million Disney went to great lengths to create a “castaway” atmosphere. They even designed the structures on the island with ship wreckage like materials. The cruise port once featured the Flying Dutchman on the shores near where the docking area. Surprisingly, only 55 acres out of the 1000 acres have been utilized. The rest of the island is still intact and untouched. Thus, enjoy discovering all the indigenous trees and animal life on exploration tours of the island. Another thing that Disney put a lot of effort in, is dredging the shores of the Cay to create a docking area at the beach. 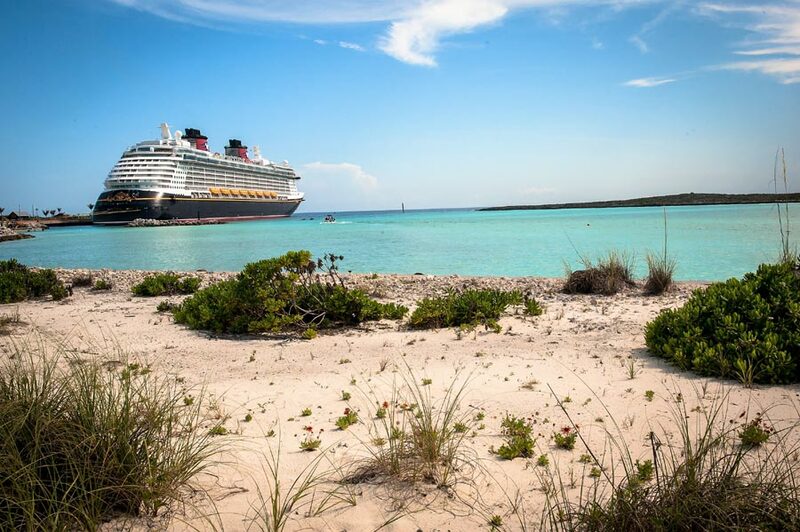 Making Castaway Cay the first private cruise port that didn’t tender. Once at the port, you will be greeted by a beautiful scenery of the beach, the large swimming area, and snorkeling lagoon. One of the first stops on the island is the post office, which sells original Bahamas stamps with a Castaway postmark. Send yourself a postcard with these stamps which cost about $0.65 and enjoy receiving this souvenir back at home. Just next to the post office is the tram station. Take a free ride on the tram to any part of the island. But if you love nature, the scene is much more enjoyable walking. Besides, the developed parts of the island are accessible via foot. Just ahead is Merge’s Barges Dock where boat tours start from. Further ahead you will see a gazebo, where you can meet, greet and take photos with your favorite Disney characters or enjoy and dance to island music. The most recommended activity on Castaway Cay is exploring the port on a bike. The cay has an amazing 2,400-foot runway at the abandoned airstrip. It was built in the early 60’s by a wealthy investor who was interested in the agriculture of the island. The airstrip is not functional currently and is best used for bike tours of the island or by trams. Rent a bike at $15 an hour for all ages and take the bike tour of the island, exploring the indigenous plants, bird life, and animals in the island. The second most recommended thing to do here is just relaxed at the beach. Castaway cay features those gorgeous white sandy beaches and crystal clear turquoise waters of the Bahamas. That makes the place look like paradise. You should buy sunscreen before your cruise as it can be expensive on the ship. To start off there is the Family Beach, which is the largest beach and has several sections on it. There are plenty of sun loungers, beach chairs and Hammocks to enjoy your day in. The only trick is to arrive early to get the ones under the umbrellas. So, leave the ship early to secure a shaded spot on this beach. One great thing about this beach is as the name suggests it’s a family beach with plenty to do for all age groups. You can lazy around at the beach or go for a swim in the shallow waters of the sandbar. Rent a float or in-tube and float the day away. Or bring your snorkeling gear to go on a snorkeling tour of the lagoon. Where you will see different colored fishes, a submerged submarine from 20,000 Leagues Under the Sea which was used in Disney’s Atlantis theme park. And spot secret mickey and mini mouse statues in there. However, as is common with beaches near the pier, the family beach gets crowded fast. This can lead to not a so amazing experience with hordes of people in the water with you. To get a better and less crowded spot, move further left on the beach away from the aqua park. If this still doesn’t do it for you, hop on a tram that will take you to Serenity Bay. Serenity Beach is further away and is an adult only get away. It’s also the beach with the cabanas. Which can accommodate from 6 to 10 people and charges from $300 to roughly $550 for a day pass for a cabana. All your beach items can be purchased from Amazon by clicking here. The atmosphere in this beach is much more quiet, calm and tranquil. 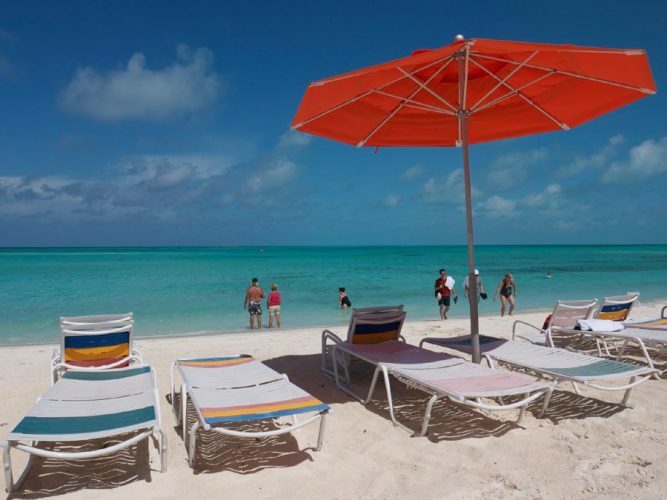 Allowing you to get the best out of your day at Castaway Cay. Grab a sun lounger, go for a swim, or float on the expansive sandbar at the beach. You can also get a massage at the beach, to complete your perfect relaxation day. Once hungry, grab a complimentary lunch at Serenity Bay BBQ located in the bay. Which serves great BBQ’s, hot dogs and other common food fares. Actually, you are better off getting lunch here than at Cookie’s joint on the island. Because they add more items on the menu at this beach, like steak or lobster dishes once in a while. If you are a semi-beach bum and active kind of person, then try the sports beach, at the family beach. It has games like volleyball and tetherball. It’s also called the teen beach, as teens tend to hang out here. To enjoy teen like activities offered in this section of the beach. Bring your snorkeling gear to the port, as snorkeling is among the best things to do in Castaway Cay, Bahamas. Right off every beach is a large snorkeling lagoon that is roped off and strictly for snorkeling. Disney is currently involved in the preservation of the marine life. It is actively doing this through Marine researchers who are planting spines from sea urchins to create more coral life in the water. These coral reefs then provide homes for the fish. Snorkeling travel gear can be purchased from Amazon right here. Enjoy exploring and swimming among colorful schools of fishes in Castaway Cay, Bahamas. Apart from the snorkeling just right off the beach, the cruise line also offers snorkeling excursions. One such excursion is a catamaran ride to Shipwreck Cove. Which just as the name suggests, means snorkeling on top of a submerged shipwreck and enjoying encounters with sea turtles, stingrays, a variety of fishes even barracudas. Enjoy this excursion on the 65-foot-catamaran, sunbathing on its decks, or enjoying the breeze in the cockpit. Another snorkeling excursion takes place on a 28-foot rigid hull inflatable boat. This 30minutes ride will take you to a designated snorkeling spot. Which features plenty of fish in its reef system. Enjoy swimming and exploring such sea animals as conch, damselfish, butterflyfish, grouper, squirrel fish even spiny lobsters. You will also get to enjoy a complimentary drink and snack on this excursion, which costs $109 and above. Mix your beach day up with part aqua part fun and part sunbathing at Pelican Plunge. This water park is found adjacent to the family beach and a couple of yards out in the water. It features 2 water slides, one which is open-ended and the other which is a closed tube. Enjoy sliding and plunging into the water at this park, while cooling off under the cascading waters of the tipping water bucket. 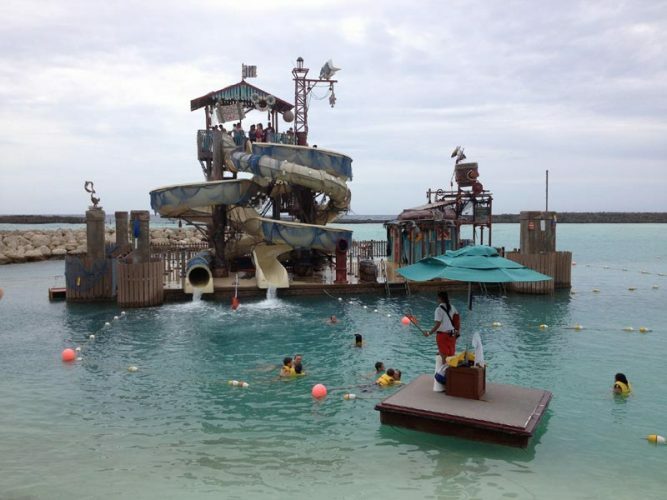 Your kids will love Castaway Cay, Bahamas. Disney Cruise Line has put up supervised play areas, water parks, and kid-themed activities at this port, to entertain your kids for free. For a day of water and fun, take them to Spring a Leak, a 2,400 square foot water play area. Here they can explore washed away beach dwelling and gasp in surprises followed by giggles as they explore this storm-ravaged structures. While your teen hangs out at the teen hideaway. For the very little ones, a few hours at Scuttle Cove under supervision will start their day off on a high note. Here they can play in the sand, or at the water splashing area featuring geysers and bubblers. Or they as well as you can locate your favorite Disney characters all over the island. To take the perfect photos with them, better than what you get on the ship because the islands provide natural lighting. There is also numerous photo op, with the Disney character painted Easter eggs scattered all over the island. While at it visit Olaf’s Summertime Freeze and enjoy tasty frozen slushies. Escape the intense Caribbean heat in da shaded play area. A shaded structure found just near the family beach. Where you can engage in a game of table tennis, foosball, basketball, and billiards. Have fun with your friends, and break into laughs as you bring your competitive spirits on. Take a scenic tour of the island through a hike and kayak tour combo. To start this excursion off, you will go on a 45 minute guided hike through the rural landscape of the island. While your guide gives you details about the environment and history of the place. Then you will embark on a 1-hour snorkel tour of the island’s beautiful coastlines. End this trip at an exclusive beach, accessible only to the people on this tour. For just $71 enjoy this scenic and informative tour of the island and return for an afternoon of sunbathing at the port’s beaches. You’ll need bug repellant when doing activities like this, get from Amazon here. Go on a shallow water and fly-fishing adventure. Hop on a troll boat or a flatboat at Merge’s Barges dock and go on a Caribbean fishing expedition. Any of this fishing boat tours will take you to the Abaco flat’s famous fishing spots. Where the water is 5-15 feet deep, perfect for marine life. Enjoy catch and release fishing at these spots and carry home tales of the one that got away. This trip will cost you anywhere from $160. Feed, touch, pet, and snorkel with stingrays at stingray lagoon. This is an adventure you won’t want to miss. Feed the stingrays, right from the palm of your hands and feel their silky-smooth skin on you as they swim by the feeding ramp. Later snorkel among the stingray folk that calls this island home. Lunch on this cruise port is free and served at Cookie’s BBQ. Enjoy a nice hearty lunch of hotdogs, hamburgers, steak, fresh fruits, veggie burgers, couscous, coleslaw, Bratwurst, mango and mint soup. For dessert enjoy fresh chocolate chip cookies and ice-cream served at soft and serve. On the drink’s end head over to Conched Out bar near the family beach for frozen concoctions. Or Castaway Air bar at Serenity Bay. You can also get a drink with a better view of the ship at Heads Up bar near Pelican Plunge or at the Sand Bar on the opposite end. While on this island ensure you try the shopping. Grab Disney labeled souvenirs at She Sells Sea Shells and Everything Else or Buy the Seashore. These gifts are not found anywhere even on the ship, hence don’t miss the chance to by this Disney themed gifts and souvenir. This is also the best place to buy things you might need on your beach day, like beach toys for the kids. The hottest months on the island are from June to August, with temperatures ranging in the lower 80 degrees Fahrenheit. This is also the wet period in the island, with it receiving rain almost half of the month. January to April is, however, the coolest and also the driest period in the island. With temperatures ranging from the lower 6o’s degree Fahrenheit to mid-70’s. The sea water is however relatively warm from April to November, with temps ranging from 79 degrees Fahrenheit to the lower 80’s. 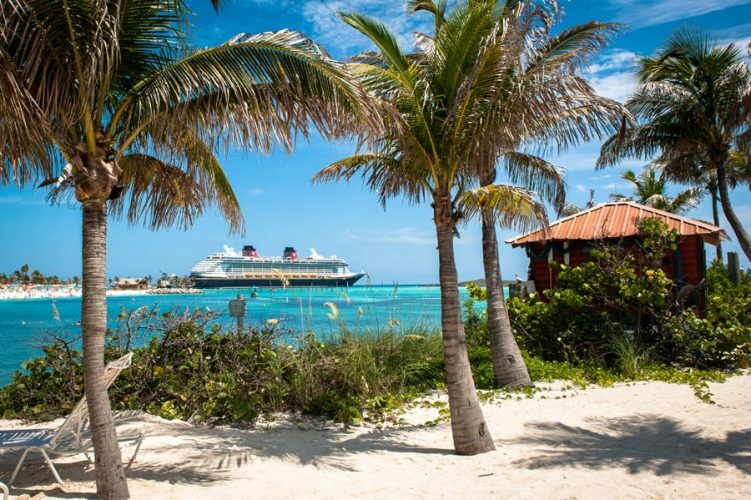 As you have read, Castaway Cay is not a destination to be missed. Book and start planning for your next trip here, to enjoy all the wonders of this island. You can save costs by taking the getaway packages. It offers you a float rental, one-hour bike access and snorkel gear at $57 and $32 adult and kid respectively. Even If you carry your own snorkel gear, you will be required to wear a snorkel vest, the waters at the lagoon are a bit deep. You might or might not be charged for the vest, check with the ship. You don’t need to come with a baby stroller, they are available at the port for rent, for free. That’s it for now, enjoy your cruise to Castaway Cay, Bahamas and if you discover another fun thing worth mentioning, let us know. Happy cruising! !